Size of this PNG preview of this SVG file: 461 × 599 elementa imaginalia. Aliae mensurae: 184 × 240 elementa imaginalia | 369 × 480 elementa imaginalia | 461 × 600 elementa imaginalia | 591 × 768 elementa imaginalia | 788 × 1 024 elementa imaginalia | 500 × 650 elementa imaginalia. العربية: شعار النبالة لجمهورية فايمار (1928-1933) و لجمهورية ألمانيا الاتحادية (1950 حتى الآن). Deutsch: Das Reichswappen in seiner Form von 1928 bis 1933 und Bundeswappen Deutschlands seit 1950. 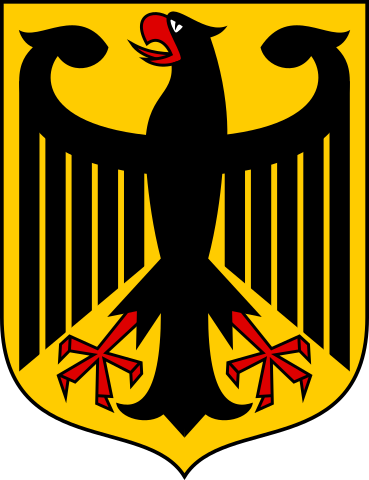 English: Coat of arms of the Weimar Republic (1928-1933) and of the Federal Republic of Germany (1950 to date). 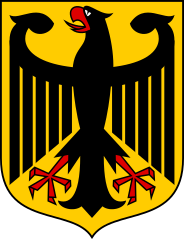 Español: Escudo de armas de la República de Weimar (1928-1933) y de la República Federal de Alemania (desde 1950). Fons Bekanntmachung über die farbige Darstellung des Bundeswappens. Vom 4. Juli 1952. In: Bundesanzeiger Nr. 169 vom 02. September 1952. This coat of arms was created with a text editor. 17:48, 4 Aprilis 2007 640 × 800 (3 chiliocteti) Tene~commonswiki Cleanup. The copyright info should really be structured within semantic elements. 21:01, 19 Martii 2006 480 × 600 (3 chiliocteti) Pumbaa80 Re-upload. There seems to have been a transmission error.